The property is showing some wear and tear...the light fixtures are in need of repair as there are no ceiling lights in the main bedroom and game room sitting area which makes it very dark and the lighting by the kitchen counter and stove is horrible like cooking in the dark. The reviews stating the concerns of the road leading to the cabin are spot on...it is a very steep winding road and you better be a confident skillful driver and hope it's not raining or snowing which would make it tough to reach the cabin. The experience overall still was a very great time for our family but the things mentioned could be a bigger issue for others so make your choices wisely and do listen to the reviews because if you take the majority of the same concerns it is highly likely that they are true. I will say 100% the experience with Cabins Usa is always a positive one so just take your time and review as many cabins as you can and you will find the right one most of the time. We had issues getting up the driveway because of rain. It's definitely a lot easier to have a vehicle that's capable of 4 wheel drive. Once we got into the cabin, we noticed the floors in the game room were really sticky. There was a sticky mess on the end table in the game room. You could actually see a ring where a cup was that dripped onto the table and caused the stickiness. The stairs were sticky. The quilt in the main bedroom smelled really bad like it's never been cleaned. There was a rotten food smell coming from the kitchen sink that was so bad we couldn't even sit in the living room. The floor and floorboards had quite a bit of dust on them also. I wouldn't stay at this cabin again, but I'll continue using Cabins USA for future cabin rentals. We celebrated Thanksgiving 2018. The cabin was wonderful and we truly enjoyed our stay. I highly recommend utilizing your best driver, and ensuring your vehicle is in great shape especially, the Tires!! The location of the cabin is very steep and can be intimidating for some driver. I was amazed with how clean the cabin was. The ladies at the CABINS USA office were extremely sweet and helpful. I have read the reviews on the dive to "endless joy", it seemed that some people complained about how hard it was to drive on the roads. They are no different than any mountain road, do not let that stop you from experiencing a great cabin and location! We had a great time! My family had a great time during our stay at Endless Joy! Inside, the cabin was beautifully done, cozy yet cool, and had plenty of space/things to do on 3 levels. Pool, Air hockey, and Foosball were enjoyed by all. Ping Pong too. Internet worked well. Never used the TV's. 1. As others said in their reviews, getting there could be worrisome. If there is any snow, and you don't have 4 wheel drive, I can see it being very tough. We watched several trucks struggle to getup the hill and had tires squealing to make it up. 2. Bring your own potholders, coffee filters, pillows(they were pretty bad), extra blankets. 3. Also bring soap, bar soap, shampoo, dish detergent, laundry detergent, dish washer detergent(the starter sets of these lasted a day). 4. Hot tub is on the first deck, accessible from the ground. This is a problem if you have anyone in your party with fear of bears. We had a bear under our deck 4 of the 7 nights checking out the trash bins. The steps to the deck are right next to the trash. This made the desire to use the Hot tub at night much less. I would have chosen a different place had I known this. Overall, I would use CabinsUSA again. We passed several great looking cabins, so while I would not rent this one specifically, I would for with them for our next trip. Great cabin! Little things here and there should be fixed up but not bad. Also I think they should have the trash cans In a metal cage. It was nice to see a bear at the cabin but having to keep cleaning up the trash wasn't fun. But it was a great place to stay at! need to fix trash cans so bears can get in them. had a few visits from a mother bear and two cubs. had to pick up garage a few times. The cabin was perfect for our family. The kids enjoyed the game room. The soda sleepers were not comfortable so the kids didn’t pull the out. The kitchen could use a new set of knives and a couple more items for cooking as we like to cook instead of eating out every meal. Overall, we loved the location, the layout and will book again. The picture is a little misleading but, still a nice cabin. Far enough from other cabins yet close enough to town and attractions. My only complaint would be if the heating/cooling system is not operable that they notify you of such. The day we arrived the cabin temperature was near 80 degrees and very stuffy. I will say they did have fans available so that helped. We only had a couple of days with warmer temperatures but, had we booked in the summer months I would not have been a "Happy Camper". Main problem was very steep and narrow hill with tight turn to get up to cabin. We were not aware about this and could not get up there with 15 passenger van. We had to unload many suitcases and boxes of food and walk it up 250 steep feet back and forth. Cabin was also a little worn and some minor things broken or non-functional. None of these negatives were represented by pictures. We did have a good time overall and enjoyed the cabin other than challenges above. But we would have to pick a different cabin next time. The cabin was beautiful and the scenery was amazing. The only thing I would suggest, unless I overlooked it, is when someone books a cabin, unless they are familiar with the area, it would help to know how high up the mountain the cabin is located to make sure the guests have the proper vehicles to get up there and not get stuck or mess up their cars. Other than that we had a great stay. WHEN ORIGINALLY BOOKING THIS CABIN, IT WAS BEAUTIFUL IN THE PICTURES. ONCE ARRIVING A THE LOCATION, WE COULD NOT REACH THE CABIN DUE TO ALL THE DEBRIS COVERING THE DRIVEWAY. THEY SENT SOMEONE OUT AS SOON AS THEY COULD AND IT HELPED A LOT. THE NEXT MORNING WE STARTED TO TAKE A SHOWER AND ALL THE TOILETS STARTED TO OVERFLOW AND THE SHOWERS WOULD NOT DRAIN. I CALLED AGAIN. ONCE AGAIN, THEY SENT SOMEONE OUT. A FEW MINUTES LATER I RECEIVED A PHONE CALL LETTING US KNOW THAT THEY WERE MOVING US TO THE RENTAL ENDLESS JOY, WHICH WAS AMAZING. Thank you for taking the time to letting us know about your recent stay in Endless Joy! We here at Cabins USA work hard to make sure each of our guests have the best stay possible while vacationing in the Smokies. I apologize for any inconveniences during your stay, but glad it was corrected. When you are ready to stay with us again, please mention you are a return guest for an additional discount. Thank you again for your review and thank you for choosing Cabins USA! Loved this cabin! The first day we arrived a mama bear and 4 cubs greeted us as we were unpacking. Loved how secluded the cabin was. Enjoyed the hot tub and the game room. However the ping pong net was broke so me and my boyfriend acted as if there was a net lol just an invisible one! The only thing that was an issue was usually with you guys y'all keep dishwashing liquid or something for dishwasher but there was none available. I did have to purchase that. And one night we went to make supper and they have no kind of pizza or cookie flat pan for cooking lol we learned the hard way! But other than that this was a beautiful cabin and I would come back in a heartbeat. Love the location! I am so happy to hear that you enjoyed your stay in Endless Joy! We here at Cabins USA strive to give each guest the best stay possible while vacationing in the Smokies. Thank you for letting us know about the net on the ping pong table and lack of backing sheets. Your comments have been forwarded to our maintenance department to be addressed. When you are ready to stay with us again, please mention you are a return guest for an additional discount. Thank you for choosing Cabins USA and we look forward to seeing you again soon! Loved the secluded location, it's a beautiful cabin without a doubt. The housekeeping could be improved, dust on the back of the doors, on the fans. The bedspread and pillows are a bit outdated and overused, for the cost of this cabin they should be replaced. The downstairs bedroom television didn't work the entire time we were there, when we put a load of dishes in the dishwasher the water ran completely across the kitchen floor and through it to the downstairs game room. Maintenance was called they supposedly fixed the issue, we placed a load of dishes in the wash as specified in the checkout policy only to find the sink filling on both sides with dirty water as it ran. The hot tub doesn't really get as hot as expected and the controls to make adjustments are very difficult to read. over all we were very happy with our stay the only real issue we have was the outside ,beer cans and bottles all around the property i feel the grounds keepers or house cleaner should be more attentive to thus area as well,but my children didnt mind cleanig it up so yes all and all we were very pleased. Thank you for taking the time to let us know about your recent stay in Endless Joy! We here at Cabins USA work hard to make sure each of our guests have the best stay possible while vacationing in the Smokies. I apologize for the cleanliness issues you experienced during your stay. Your comments have been forwarded to our housekeeping supervisor and she will be addressing it with the cleaner. When you are ready to stay with us again, please mention you are a return guest for an additional discount. Thank you for choosing Cabins USA and we look forward to seeing you again! Thank you for taking the time to let us know about your recent stay! We here at Cabins USA work hard to make sure each of our guests have the same great stay you enjoyed while vacationing in the Smokies which is why we provide our guests with turn-by-turn directions to the cabins. I apologize for the cleanliness issues you experienced. Your comments have been forwarded to our housekeeping supervisor and she will be bringing this to the cleaner's attention. When you are ready to stay with us again, please mention you are a return guest for an additional discount. Thank you for choosing Cabins USA and we look forward to having you as our guest again! I enjoyed my stay the only issues that I had with cabin was there was cans, and bottles all over the side and front of the cabin, the cabin could have been cleaned a little better there were giant spider webs in the windows, also the hot tub on the one side the water kept coming out of it because it was not even on the porch. All in all I would defiantly come back. Needs to be cleaned up outside. Trash is thrown all on ground over looking balcony. Porch has settled so the water in hot tub all goes to one side, but works very well. Game room has no heat. Was very cold during our stay and we could not use this room because it had no heat. This is the reason I rented this cabin for the games, I am very disappointed that i could not utilize this room. I booked this cabin for a surprise birthday weekend for my husband. The cabin is great and staff were all super great to us. The game tables do need to be replaced but aside from that we enjoyed our stay! I am so happy to hear that you enjoyed your stay in Endless Joy! We here at Cabins USA work hard to make sure each of our guests have the best stay possible while vacationing in the Smokies. Thank you for letting us know about the game tables. Your comments have been forwarded to our maintenance department to be addressed. When you are ready to stay with us again, please mention you are a return guest for an additional discount. Thank you again for your review and thank you for choosing Cabins USA! The cabin is AWESOME, only issue we had was finding the place . One should be given directions from one entrance the first entrance my vehicle which is a Chrysler Town and Country was just spinning tires and not moving very scary. Beds were very comfortable. Couches a little worn but not that big a deal . Air hockey table did not work that well but was useable. Overall stay was great , once we got there !!! Thank you for taking the time to let us know about your recent stay in Endless Joy! We here at Cabins USA work hard to make sure each of guests have the best stay possible while vacationing in the Smokies. Thank you for letting us know about the couch and air hockey table. Your comments have been forwarded to maintenance to be addressed. Thank you again for your review and thank you for choosing Cabins USA! I loved the check in check out process. It was so easy and hastle free. The cabin wasnt hard to find, but the roads were a little steep. The cabin was aweosme! :) The furniture was a little worn, and the pull out couches were very uncomfortable. The cabin could have used a big cleaning and re-staining of the floors. There were no deal breakers for me not to stay there again. The cabin was lodged in a cute little area and very private. We had such a nice time! We will definitely be staying again. The only issue we had with our stay was actually finding our cabin. The directions sent us close to the cabin, but not to the actual site. The road was too steep for us to make it up in one direction and when we figured out how to get to it from another direction we missed it the first time, because the trees completely hide the cabin and there was no signage from the road that it was our cabin. Otherwise, we had a great time and plan to visit again soon! Thank you for taking the time to let us know about your recent stay in Endless Joy! We here at Cabins USA work hard to make sure each of our guests have the same great stay while vacationing in the Smokies. I apologize for the issue you experienced with finding your cabin. We will make sure the directions we give our guests are accurate. When you are ready to stay with us again, please mention you are a return guest for an additional discount. Thank you again for your review and thank you for choosing Cabins USA! Love the cabin, just need to do some work on road to get to the cabin, it is terrible. Cabin was clean, and had everything you needed for cooking. Just watch out at night for bears, look before you open the door. Would stay in this cabin again. Thank you for taking the time to let us know about your recent stay in Endless Joy. We here at Cabins USA work hard to make sure each of our guests have the same great stay you enjoyed while vacationing in the Smokies. When you are ready to stay with us again, please mention you are a return guest for an additional discount. Thank you for choosing Cabins USA and we look forward to having you as our guest again! I feel the company should have provided more communication to the customer. My family and I booked our second vacation through Cabin USA and we traveled 8 hours to find out there was an issue with the express check in at the last minute. Next, the location getting there was very steep and narrow trying to get in and out the location, especially when its raining or another vehicle is trying to pass, my wife refuse to drive to and from the cabin due to fear of an accident. Last, the stove went out and was very inconvenient during our stay, we had to spend extra money on food due to the element in the oven out for the entire four days of our stay. The cabin is extremely nice and cozy, but communication needs to be improve. We came for my Birthday with a group of 9 of us to stay in the cabin. We had a blast & it had everything we needed to make our stay the best it could be. We really enjoyed how spacious it was since we had such a large group as well as the air mattress that was there for us to use, was great. The only thing that wasn't the best is when we arrived we wanted to eat immediately & the oven was broke so that was a bummer. Also, the first night our refrigerator wasn't working. I called Saturday morning and they went straight to our cabin and fixed our refrigerator but were unable to ever get the stove fixed during our stay so some of the food we brought was unable to be used. We were only there for 2 nights and we really did have a BLAST! Check in was great doing it all online as well as checking out was perfect too!! The roads to get to the cabin were pretty scary but definitely doable. We came at night the first night and it was pretty scary for us girls but managed to make it the following day in the day light. Thank you for taking the time to let us know about your recent stay in Endless Joy. I apologize for the issues you experienced with the refrigerator and stove, but I am happy to hear that we were able to take care of those for you. When you are ready to stay with us again, please mention you are a return guest for an additional discount. Thank you for choosing Cabins USA and we look forward to having you as our guest again! We had a great stay in endless joy with only a few issues. No issues were big enough to call and request service while we were in the cabin but hopefully they will be addressed. 1. The stove would not reach the set temperature. It seems as if it was stuck in pre heat. 2. The couch on the main floor is in really bad shape. In order to not fall into a hole in the middle we had to place pillows under the cushions. 4. The rocking chairs need to be repaired ( first floor rocking chair the back was loose, Second floor rocking chair was missing a few slats in the seat area. The biggest disappointment was the amount of trash around the cabin outside. The view from either balcony reviled beer bottles and multiple other trash items in the grass below. This could have been caused by wildlife getting into the trash and spreading it around. I noticed in a previous review that one of the handrails had to be replaced, I notices the old handrail laying on the side of the property below. Overall the cabin was great and we will return to the area and to cabins USA. We may try a different cabin next time but we will be back in 2017. We stayed there for our 2016 Spring Break with the kids. First let me say that I'e never had a check in go so smoothly and quick as I did with this one. The game room was good for the kids (minus the air hockey, due to broken paddles) But they loved the hot tub, pool table and yes even had WiFi so they could go online. We plan on making this a family tradition and will be back again. The price is right and if you're like us we packed everything and didn't have to worry. When we discovered that the coffee pot wasn't working, they immediately came with a new one and took care of little odds and eds while there. The kids even said they enjoyed this family vacation and beats Disney hands down. Best kept secret for family vacations. Thank you for all of your kind words! We here at Cabins USA work hard to make sure that each of our guests have the same great stay you enjoyed while visiting the Smokies. When you are ready to stay with us again, please mention you are a return guest for an additional discount. Thank you again for your review and thank you for choosing Cabins USA! Over all was a great stay. Bed was a little stiff and couch bed could of been a little more clean on the sides but was a great stay and the little bears that visited the trash can in the middle of the night was cute and a good experience to get a look at the cubs. I am so happy to hear that you enjoyed your stay in Endless Joy and were even able to see some of the local wildlife! We here at Cabins USA work hard to make sure that each of our guests have the same great experience you enjoyed while vacationing in the Smokies. When you are ready to stay with us again, please let our reservationists know you are a return guest for an additional discount. Thank you again for your review and we look forward to having you as our guest again! We loved the cabin! We had everything we needed to cook meals in the kitchen and the grill. The beds are very comfortable, however the sofa sleepers are not. The kids didn't even pull them out; they just slept on the couches. Luckily we had our own throw blankets for them because we didn't find an extra quilt until we were checking out. We put the address in Google maps and found it difficult to get up the steep hill in front of the cabin. After a couple times of doing that we realized that Cabins USA had given me driving directions for a different route . We used those directions after that as they made getting to the cabin a lot easier! We had a great time on our family vacation! Thank you for your review Dana. We are delighted that you enjoyed your family vacation with us at Endless Joy. We apologize for any inconvenience you family encountered. We hope that we will hear from you again very soon. The cabin was great. Looks just like the pictures. The roads to the cabin are very narrow and steep. Probably need 4-wheel drive during in rain/winter. The cabin was actually well-stocked with dishes and cooking utensils. All new appliances. Only 'issue' would be the plumbing. The pipes sounded as though there were air pockets in the pipes. Made terrible noises when running the water or flushing. Our refrigerator had a leak and maintenance came out that day and fixed it. Also, one of our guests found several red spots, similar to spider bites, on his legs. Not sure if this is from staying in the cabin or not, considering we didn't do any hiking. Overall, the cabin was a nice experience. The cabin looked exactly like the pictures on the website. We will definitely book another cabin with Cabins USA. The cabin was beautiful, and we enjoyed our stay. My only recommendations would be to replace the pull out couches. The mattresses are in no condition to sleep on. The other would be the location. There are several steep inclines leading to the cabin. The cabin itself is great, but was in need of numerous repairs. Some were safety related and some were more minor. The mattresses on all pull outs were not usable. They were pure springs and no child would even sleep on them - way too uncomfortable. Sleeping on the couch was better but not what we thought we'd be doing. Anyone not comfortable driving on a VERY steep mountain road should be made aware of the drive to this particular cabin or any cabin on this loop. We could not see the road below the hood of our car when we crested the hill. I'm glad my husband was behind the wheel and not me. I would have been very uncomfortable with our kids in the car on that road in our minivan even with perfect weather conditions. We just are not used to driving on those kinds of mountain roads but after the first time we got more comfortable with it. Thanks again for a great trip and we hope to be back after they take care of the list of repairs I called in and gave them today. My husband and I loved this cabin. We just wanted a little weekend getaway and couldn't have asked for anything better. The cabin was beautiful and clean. It was secluded yet close enough to town. We went in January, so the only complaint I do have is the down stairs where the game room is was pretty chilly. But other than that, it was awesome! We will be back!!! This cabin is beautiful! Everything about the cabin was very clean!! The gas fireplace was really nice. The game tables downstairs were wonderful. Only draw back about the cabin was that the lighting was very poor. The can lights in the kitchen celling were pointing to the wall instead of the counter and the sink. Easy fix but of course we didn't have a ladder to reach them. Comfort, I gave a rating of 4 because the couch in the main living room was beyond terrible! Although, the couch is leather and looks nice, its appearance is deceptive. You could barely sit on the ends of the couch and just forget about the middle you practically sank to the floor. Thank goodness we brought an air mattress with us b/c this was the sleeper/sofa we were supposed to sleep on. The other 2 beds were wonderful! I would definitely stay here again after those few things were addressed. We stayed in the cabin for our honeymoon, and we absolutely loved it. It's a beautiful cabin, inside and out. The cabin is furnished with everything you could possibly need. The staff were very welcoming and helpful. I recieved a courtesy call after our first night, to make sure everything was to our liking. Things like that are the reason I would highly recommend this cabin and company to anyone. We look very forward to staying here again on our next trip to Tennessee. Thank you for your review. We apologize for the issues you experienced during your stay with us. We will insure that this information is passed down to the correct departments to insure that they are addressed. We appreciate all your feedback on your stay with us, and we hope that we hear from you again soon. We had a great stay and the cabin was beautiful!! All 4 kids are ready for next year!!!! We had a great time, and really enjoyed 'Endless Joy'. We liked the layout of the cabin and location; different and a little more secluded than what we had in the past. Cabin had all the amenities you could ask for and I could easily see us coming back to this same cabin next time we visit GSMNP. The only complaints any of the four of us had was that the housecleaning was subpar and many of the outlets were missing the covers, or face plates. At first look, everything seemed to be nice and clean but the longer we stayed the more we noticed how much of a good cleaning the cabin could use. Floors looked as if the main walk ways were clean, but upon closer look it appeared as though everything was just swept under the furniture or into the corners. Cabinets, counter tops, window sills looked as though they had not been dusted or wiped off in months. Knowing that we were staying for a number of nights, my wife and I commenced to do some cleaning ourselves in order to make our stay a little more comfortable. It wasn't 'horrible', and I realize we were in a 'cabin', but it was dirtier than I would have expected, and dirtier than I'd keep my own place. The pros or our stay far, far, outweighed any of the negatives though. We can't wait to come back. Thank you for taking the time to write your review Steven. We appreciate all your feedback. We will have the cleanliness addressed and taken care of immediately. We are delighted that you had such a great time with us. We hope that we will be hearing from you soon to assist booking your next great vacation in the Smokies. We all enjoyed the cabin to the fullest. It was higher to get up to than we have planned have a car and one suv but we were able to make it work. It all worked so wonderfully and we felt blessed with the cabin. The car has a hard time getting up there but we made it work just fine. It is a great place to stay and we all enjoyed the experience in the mountains. Everything at the cabin was good for the most part. The only complaints I have are that the amenities listed a grill that was not there and the fridge wasnt very cold. Be sides that my stay was very enjoyable. I will definitely use Cabins USA again, with a different cabin choice. This property has the room for the masses. The only problem with the property are the roads getting into the property. If you have four wheel drive you will make it fine or if you enjoy a roller coaster. The cabin was clean and well maintained except for the shower heads. They need to be replaced as they don't offer a good shower experience. Overall, the cabin was very nice. Not one I would recommend for the winter months with the lack of heat in the first floor and the drive into the property. Thank you for taking the time to write your review Jessica, and sharing your experience with us. This cabin is a large cabin that can sleep up to 10 people. The roads leading to the cabin are curvy and we do recommend a four-wheel or front wheel drive, especially during the winter. We are also in the process of getting the shower heads replaced. Again thank you for bringing to our attention a couple of issues you experienced. We hope to see you again soon. Don't forget we offer our return guests an additional discount! the only problem i had was that there was suppose to be a grill on the deck and there was no grill. We enjoyed our 2 nights stay at the Endless Joy. However, the 2nd floor shower door would not shut properly so we had to put a towel over it to close it. So we used the 3rd floor shower the next night and that bathroom/shower is so much better than the middle floor. We did not use the hot tub as we did not have time. We LOVED play the game room especially the pool table. We've used Cabins USA for few years in a row and Love it! The cabin location is not that great. We've stayed at other cabin which is much better and location is great as well. We will come back to use Cabins USA to pick a different cabin next time, hopefully next year! Great time! Only comment is you should prepare ppl on how steep the road is. Had problems with drains (sink and shower draining VERY slowly). Called, but the problem was never resolved. We had a nice stay at Endless Joy. The only thing I would say I was disappointed in was the location. It's in the mountains but there is no view and the scenery was not that great. Other than that, everything was great. Thank you for choosing Cabins USA Gatlinburg. We are so happy to see that you enjoyed Endless Joy. We are sorry to see that you didn't enjoy the location of Endless Joy. Endless Joy isn't advertised as having a mountain view but only a wooded view. We do hope that you will stay with us again soon. This cabin needs an overhaul! My husband and I are not picky sleepers but the mattress in the loft was so lop-sided we could not sleep at all. The hottub which is the main reason we stay in a cabin as opposed to a hotel, smelled of mildew so bad that it gave us a headache and we had to take a shower afterwards. The location is INSANE. Do not stay here during the winter months. The roads are so steep that our vehicle barely made it up a hill on dry pavement. Not condusive for a family with small kids. Staircase to main entrance and then a staircase to the main level and another staircase to the top bedroom. Why would the owners pay for an extra sport's package on Direct TV and not pay for the local channels is beyond me. We couldn't even watch the UT game or find any information on the weather for the day (no internet service either.) The glasses in the cabinet had fingerprints on them as well. The staff for Cabins USA were accomodating and offered us a credit to use at another time, but we will never stay in this cabin again! Thank you for choosing Cabins USA Gatlinburg. We regret to hear that your stay was anything short of perfect. Our cabins are individually owned and it is up to the owner what amenities they place and replace in the cabin. This cabin doesn't advertise as having internet access. Our cabins are in the mountains so as stated in our policy it is a possibility that you will need a four wheel drive vehicle to access your cabin. We do apologize for the cleanliness issue with the hot tub and the glasses, but we are happy that you were able to get some resolution for you and your family for a future stay. Please contact our office when making your next reservation. We will still honor the online discount and we will be happy to help you in finding the cabin best suited for your needs. We had a wonderful time once we found the place and was settled in, took us over two hours of driving in the mountains to find it, we would call the after hours number it took them over three hours to call us back, by then we found it ourselfs was not happy with that, but once in the cabin it was just wonderful. They could use some different garbage cans, the animals come up nightly to get into your trash to see what they can find. That was easily remedy too, we just quit putting it out. Anyone interested in a great place come down and stay in a cabin. We will definately be back, specailly since we know how to move around up there, LOL. We are laughing about it now, but scary driving in the mountians at night not knowing where you are going. Just another adventure I guess, but we will do it again. Just amazing up there. Thank you for staying with Cabins USA Gatlinburg. We are so happy to see that you enjoyed your stay in Endless Joy. We truly apologize for any inconvenience you may have encountered while locating the cabin at night. We hope that you will give us another chance in the future to provide you with an excellent cabin stay. the cabin was beautiful, inside and out. it was pretty clean and had everything one would need. it is very secluded and VERY VERY STEEP. if i had know how high up this cabin was, i would have never rented it, it is so high up that one of our cars started sliding down the hill and had to be pulled up with the other car..4x4 definitly required ESPECIALLY in the winter. i was disapointed that there was no grassy area where we could grill, play ball, and do more outdoor activities...at night...bears were going through our trash which was located on the second level porch....SCARY! but i guess it is to be expected due to the location. all in all, great cabin, worth the money, location and outdoor space was disappinting. Thank you for choosing Cabins USA Gatlinburg. We are happy to see that all in all you did enjoy your stay in Endless Joy. Unfortunately being in the mountains there are some cabins that require possible 4 wheel drive use as stated in our policies. We do guests know at check in if there are any problems at the cabin during your stay to contact us as soon as possible so that we may correct the situation. Even with the garbage/wildlife issue we could've sent one of our cleaning crews by to pick up the trash. Next when making a reservation contact one of our reservationists here at the office and we would be more than happy to find a cabin that would best suit your needs. We hope that you will stay with us again soon. The area this cabin is in is a little scary to get to. I would make sure to remind people this is not handicapped accessible! There are many stairs in this home. We had a hard time with the stairs and both bathrooms were upstairs. The game room was on the bottom floor with no bathroom then the next level had the kitchen and one bathroom and bedroom then the top was another bathroom and bedroom. This is not clear in the information. It was beautiful and clean as long as you do not mind the stairs. More exercise than I planned on for vacation. This is a very nice cabin! There were a couple small things that caused this to not get 5 stars. FIrst is the air hockey table is broken beyond repair, the owners really should just take it out. Also there is a cabin direcly across the road with the decks facing each other, this cabin is more private than others we've stayed in but not as private as we thought! Another suggestion is to improve the map, most of the roads we crossed over weren't even on the map which made for a frustrating journey up the mountain. Overall, the cabin was beautiful, very clean, and had everything for a comfortable vacation! We always enjoy our stay and look forward to many more! Thank you for choosing Cabins USA Gatlinburg. We are happy to see that you enjoyed your stay in Endless Joy. We hope that you will visit us again soon. Thank you for choosing Cabins USA Gatlinburg. We are so happy to see that you enjoyed your stay in Endless Joy. We hope that you will visit us again soon. This is a great cabin. It is secluded nicely but sometimes hard to get up to. Part of that being our fault for not having really good tread on our tires. With their being four of us this time we brought my neices van not taking this into consideration. They were excellent to us as usual. We highly recommend a stay at one of their many cabins in Sky ridge. Thank you for staying with Cabins USA Gatlinburg. We are happy to see that you enjoyed your stay in Endless Joy. We apologize that the bed and sofa's were uncomfortable for you. We have replaced the sofa's since your stay in the cabin so we hope that you will stay with us again and give our cabins another try. We look forward to hearing from you soon. The furniture need "New furniture couches" in kitchen are "they sink in" VERY UNCOFORTABLE" . The game room unsatified.. everything broken?? the location is too complicated. We are disappointed to hear that your stay with us was anything less than perfect. We will certainly make the owner aware of the uncomfortable furniture. Had you reported that nothing in the game room worked we would have sent maintenance out immediately to get them in working order for you. All of our cabins are located in the mountains and we provide you with a detailed map and written directions to make them easier for you to find. We have also replaced the couches in the cabin. 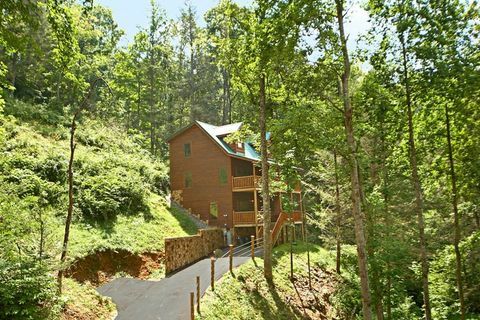 We hope that you will stay with us again on your next Gatlinburg vacation as we would love the opportunity to show you some of the other great cabins that we represent.